The energy in the air decreases as water evaporates and thus temperature decreases. In terms of evaporative cooling systems, two temperature types are of vital importance. This is the temperature which we generally consider as the weather temperature and is measured by the conventional thermometers exposed to air flow. This is the temperature which is the lowest temperature to be reached by the evaporation of pure water. Compared to dry bulb temperature, wet bulb temperature is a criterion for the potential of evaporative cooling when it comes to the evaporation in the air. Both dry and wet bulb temperature might be used in the calculation of the relative humidity. Evaporation occurs when the humidity of the air drops below 100% and the air absorbs water. Any air mass may absorb a certain amount of water and the level of absorption depends upon how much water it absorbs at that moment. The term humidity explains how much water exists in the air in proportion to the water holding capacity of the air. Air becomes saturated when it becomes unable for water holding any longer. Think of a sponge which holds water in half of its capacity. This will mean 50% of saturation. In the case of air, on the other hand, this will mean the relative humidity is 50%. Energy is a must in order to evaporate water from its liquid state. This energy is produced by the adiabatic process which is a autogenous specification of air. 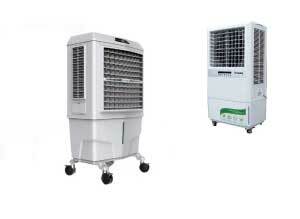 The air penetrating into the evaporative air cooler gives energy to evaporate water. The dry bulb temperature of the air passing through the cooler decreases during that process. 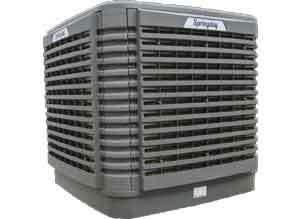 Evaporative air cooler systems make use of evaporation to cool the air. In any evaporative cooler like Springday, the pump enables the cycle of water from the water tank to the cooling pads and thus the pads get soaked. The fan aspirates the air outside the device and passes through the pads. The air gets cold by evaporation while passing through the pads. The key to the efficient evaporative cooling is to provide continuance for each cooling pad to maintain their saturation during the entire process, and to design the fan and the motor of the system sufficient enough to provide the air flow for home use. All Springday devices offer high technology and smart design specifications in order to reach the highest productivity with regards to alike all air-conditioners in the market. Contact us to find out why the Springday systems are unrivalled.